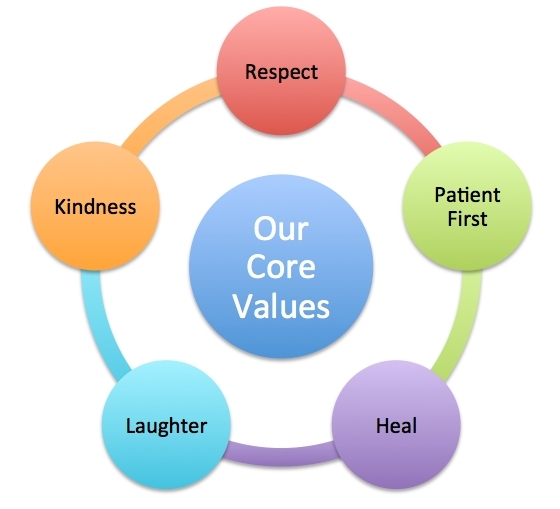 Our core values drive everything we do – from our first meeting with the patient to the ongoing care and treatment of their healthcare needs. We value the health and well being of each person and are privileged to take care of so many individuals. You will find our core values vary from typical “corporate” structures. That’s because we are independently owned. We also share our core values with potential employees and new hires. It’s part of our hiring and screening process – because a happy staff means happy patients. We Respect everyone every second of every day. We profitably Heal every patient. We keep a smile on our face and Laughter in our heart. We add value to our lives and to the lives of others by always acting and speaking with Kindness.